PG 15 Suitable only for persons of 185years and over. Not to be supplied to any person below that age. This is an Eros Internationl brand of the Hindi DVD. Has the UPC Code 828970003193. Has EROS Seal. 171 minutes Color. NTSC Format Dolby Stereo Sound. HAS ENGLISH SUBTITLES. G. P. Sippy's SAAGAR Directed by Ramesh Sippy. Music R. D. Burman. Staring: Rishi Kapoor, Kamal Hasan & Dimple Kapadia & Others. Release Date: 9 Aug 1985 (India). Raja, a fisherman is secretly in love with Mona. When wealthy Ravi comes to live with his grandmother, Kamladevi, he sees Mona and falls in love with her. Mona also reciprocates his love. Raja is devastated by this turn of events. But when Kamladevi gets to know that Ravi is seeing Mona, she puts pressure on Mona to give up Ravi and marry someone else. 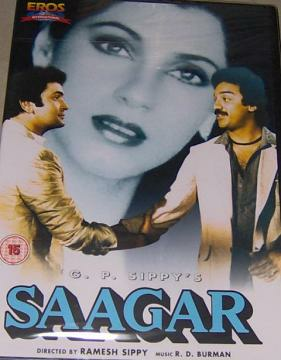 Buy Saagar-Rishi Kapoor (DVD, 2005), sold & shipped by Movie Time Video where you can shop online for Pooja Mandir, Bajot, Gifts, Hindi Movie DVD / CD, Music Video. This Hindi Movies collection has been tagged as DS07-1 1 ER 3.99 8.97 rishi kapoor kamal hasan dimple kapadia.